Blast Media – 1.Toušeňská s.r.o. The choice of the right abrasive is a fundamental part of the whole process. Its choice depends on the type of procedure: whether it is a step before final coat painting, metalizing, electrogalvanization, final aesthetic treatment, or whether it is a cleaning causing no damage to the surface of a treated workpiece. Blast media are categorized into groups according to various viewpoints: metallic / non-metallic, sharp-edged /spherical, hard / soft. Each type has its own applicability and is supplied in different granularity. Reaching the best quality results depends apart from the type and size of blast medium also on the device parameters, nozzle distance, pressure, etc. Steel grit is one of the most common materials used in closed cycled blasting machines: blast cabinets and spray booths. It is suitable especially for pressure blast machines and is used for blasting of iron materials, rust and dross removal, for pre-treatment of powder coating, painting, and electroforming. 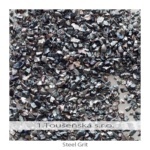 Steel grit is a highly efficient and cost-effective material. Cut wire shot is sometimes being used instead of steel grit. However, steel grit is of higher efficiency. 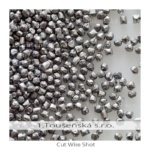 Cut wire shot is also available from non-ferrous materials such as brass, zinc, or stainless steel. 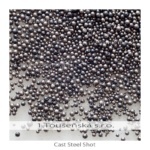 Cast steel shot is used similarly as steel grit is in mechanical blasters with wheel blast units. In pneumatic cabinets, this abrasive serves for shot peening – hardening process of stressed components, which thickens a component layer and increases its service life (cogwheels, shafts, springs, etc.). Corundum is typically utilized for sharp-edged blasting of non-ferrous metals where it is essential to avoid iron contamination of the surface. In other words, aluminium oxide is suitable for stainless steel, aluminium, brass, and galvanized iron. 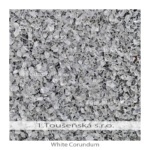 There are several advantages of corundum use: first, it is its high cleaning efficiency as it fissions during the blast process and so always creates sharp edges; second, it is its supply in a wide range of granularity and in combination with injector blast system it enables perfect regulation of final surface treatment (as a result even blasting of very thin sheet metal is possible). 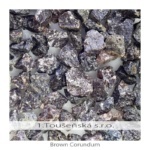 Corundum works as a pre-treatment stage or as a first stage of glass bead blasting. It can be supplied in two versions: white or brown. What has been said about corundum can be basically applied to garnet as well. 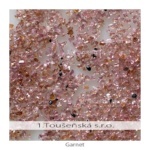 Nevertheless, garnet, unlike synthetic corundum, is a natural product and as such is supplied in lower number of granularity. On the bright side, the costs are also usually lower. Glass beads for blasting of non-ferrous metals are used either as a final treatment (usually stainless steel) or as a pre-treatment for anodic oxidation of aluminium surface or galvanization. The surface gains elegant satin look which also lowers visibility of any potential damage. The best results are reached in a so called two-stage process. Firstly, the surface is cleaned and unified by sharp-edged abrasives (corundum or garnet); secondly, the gleam is once again restored by glass blasting beads. These are supplied in number of granularity and by a combination of first and second stage size of the material and appropriate pressure it is possible to a great extent control the final appearance of a product. 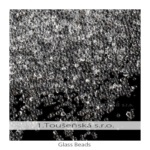 Click on Glass Bead Blasting for more information and photos of glass blasting beads application. Ceramic shot beads are of similar use as glass beads. However, thanks to their hardness they have better lifespan and as such can be used even for treatment of very hard stainless steel. They are supplied in a large scale of granularity. 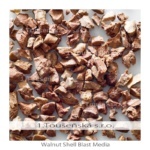 Ground walnut shells are used for cleaning of workpieces whose surface must not be damaged or hardened. They are supplied in a large scale of granularity. 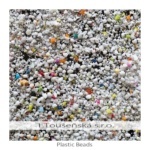 Plastic beads are synthetic product with similar employment as walnut shell blast media. It is again supplied in a wide range of granularity. Historically oldest blast medium, it was used especially in mobile sand blasting for its low costs and similar effect to corundum. Nevertheless, nowadays this abrasive media is not being used, except for rare exceptions; its use is not recommended and in many countries actually forbidden. The reason is that it is the only blast media which causes an illness, silicosis. Such a danger does not occur with any other blast media. Blast furnace slag nowadays substitutes silica sand in mobile sand blasting. For special purposes other materials such as stainless beads, aluminium or zinc cut wire shot, or brass grit are also being used.